Which part of the house do you hate to clean? For me, it’s the bathroom urgh! Not only is it hard, but it also takes forever to finish because of soap scums build ups, mold and stains that just won’t come out. Well, you guys came just to right place to get some genius cleaning simple tips and tricks for your bathroom. As I know it, newspapers as always been the best way to clean mirrors. When damped with the right amount of water or glass cleaner, this method leaves a streak free finish. What works best other than water or glass cleaners is black tea bag brewed or vinegar. Vinegar is used for ‘MANY’ purposes, both medical and household purposes. But, have you wonder why your water stains and soap scums are hard to get rid of? Well, simply because doesn’t have the effectiveness to do so. But using vinegar, lemon or both, you will be able to remove these unflattering stains and disinfect your bathroom properly. Not only does it disinfect, but it also eliminates odours. 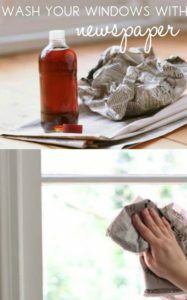 What you should do is apply the vinegar/lemon mixture, let it sit around 5 minutes and then wipe the area with a damp cleaning rag using warm water. In a cup or bottle combine 1 cup of vinegar and 3 cups of baking soda. Use this mixture and apply to the tile and grout areas. Let it sit for 15 minutes, then rinse with warm water. This is far by the most annoying thing I hate. Shaving creams or any can or metal objects frequently leave a rust stain on your basin surface, and it is tough to get rid of. But by applying nail polish to the bottom of the shaving cream, this will prevent a rusting stain from forming. This method is Genius. I like these garbage cans, but they can become annoying when the bag doesn’t stay, and rubbish gets all over the place. Well, ‘no worries man, we got it all under control’. (Jamaican Accent) Place magnets around the outside lining of the garbage bag to hold it in place. WoW!!! This method is again another genius hack. By using a screwdriver with a disinfectant wipe, you will be able to reach places that are unreachable with a cleaning cloth. Also, by unscrewing the seat, you will be able to clean the area thoroughly. To get the complete tutorial go to Ask Anna. 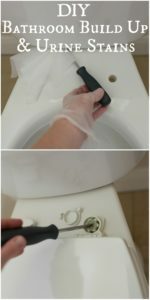 Here is a great tip to unclog your sinks, so you won’t have to worry about hiring a plumber. Tip Nut has a great tutorial on different DIY ways you can unclog your drains and also give maintenance advice on taking care of and avoiding clogged sinks. With a Ziplock bag, an elastic band, vinegar and water. You will be able to rid ‘stainy’, ‘mildewy’ shower heads. Try implementing these tips and I am sure you will see fantastic results. 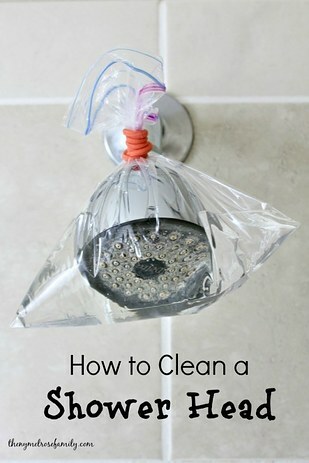 If you have your own genius tips on cleaning your bathroom, please do share, I would love to hear.